This week, India celebrated its 72nd anniversary of independence. Pandit Jawaharlal Nehru on the midnight of August 15, 1947, spoke words befitting the occasion when he said, “At the stroke of the midnight hour, when the world sleeps, India will awake to life and freedom.” Pandit Nehru in his immortal words clearly recognised the intrinsic link between independence and freedom. This month, however, ironically threw in tragic juxtaposition the lack of freedom in independent India. Since this week led up to the anniversary of India’s independence, I went back to examine the role of media during the freedom struggle. The British introduced some horribly restrictive laws, which limited the freedom of the Press, including the Vernacular Press Act, 1878, through which the British Government aimed to establish an iron-like grip over vernacular publications like Amrita Bazar Patrika, and required such publications to ensure that nothing was written against them. This was also the time when publications like Amrita Bazar Patrika were heroes. The Press was an amplifying voice of the rising whispers against an evil empire. The Press by reporting on horrifying incidents of misgovernance, like the treatment of indigo farmers and by disseminating the message of Mahatma Gandhi and co, helped provide the much-needed tailwind to the Indian freedom movement, leading up to our independence in 1947. Fast forward to today, what used to be the primary medium to speak truth to power, has now been badgered by the present Government into something unrecognisable. While there is an environment of fear and trepidation in the country, which stems from the top, there are a few examples that are disconcerting. Of these, the resignation of Punya Prasun Bajpai from ABP News is fresh and possibly most troubling. Reasons for Bajpai’s resignation are frighteningly Orwellian. In a letter penned by him, he explained the events leading up to his resignation. As the host of Master Stroke, prime-time news telecast on ABP News, Bajpai hosted the news, exposing the heights that this Government has gone to from preventing the truth from coming out. For example, the news coverage in Chhattisgarh, where Master Stroke reported that a woman farmer, during her video interaction with Prime Minister Modi, had been tutored to make false claims that her income had doubled. The report showed how, in fact, her condition had in reality become worse. Almost immediately, the BJP jumped to discredit the channel and Master Stroke. What was even more bizarre and terrifying was the disturbance in ABP’s satellite link, which conveniently started acting up during the exact time that Master Stroke was telecast and returned to normal after the show had finished. This ‘disturbance’ allegedly continued for days. Simultaneously, advertisers stopped their ads to ABP, allegedly due to pressure from outside entities. 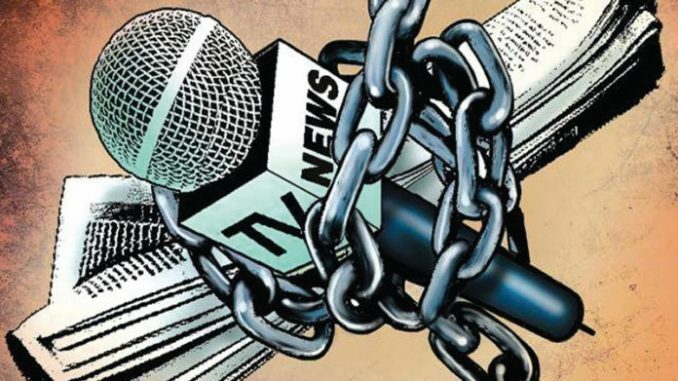 This was coupled with other restrictions on journalistic freedom, such as instructions to try to reduce references to Prime Minister Modi and limit his appearance on the news when discussing failings of the Government. This all-out offensive unfortunately but almost inevitably led to the resignation of Bajpai from ABP. When faced with the might of the entire Government for reporting on its failings, it seemed there was little else that he could do. This, of course, is not the only example. In general, the current environment in India is one of hate and polarisation. Where intellectualism is treated with disdain and accountability as an attack. The Government in power has nurtured this environment and the message is clear: Go against the BJP Government and face the wrath of the powerful. The problem is that when you create such an environment, you open doors you cannot shut. Whether it’s the vile attacks by trolls on various prominent journalists or the attacks out in the open on Umair Khalid or the lynch mobs that act without reason or fear. The problem is that the Prime Minister is at the centre of this approach towards the Press. Recently, I was a panelist on a news channel along with a spokesperson of the BJP and the questions were: Why Prime Minister Modi has not yet held a single Press conference in four years? For all the allegations that the BJP threw at Manmohan Singh for being a silent Prime Minister, Modiji and the BJP would do well to remember that the former Prime Minister did three Press conferences in New Delhi and always took questions from journalists on his trips abroad. When faced with this question, the response by the BJP spokesperson was as per the script, breaking into a monologue about the greatness of the supreme leader, saying that “Modiji is loved by all”, “Modiji talks to everyone” etc. I feared that the spokesperson was just moments away from breaking into a Modi! Modi! Modi! chant. I don’t blame the BJP spokesperson though. What can you do when you don’t have an answer to this simple question? The fact is that Prime Minister Modi believes in one-sided conversations, whether it’s his monologues or Mann ki Baat, the conversation has to be filtered so that it doesn’t hurt the image of the Prime Minister. This because the BJP is aware that this carefully built image stands on a house of cards, one where a single unfiltered/unedited question to the Prime Minister is enough to make the entire house fall. Inevitably, criticism of the Government regarding the state of the Press today is met with wilful ignorance. In the alternate universe that the BJP resides, everything seems hunky-dory. But it surely doesn’t feel that way, does it? And facts bare this disconnect. On the world Press freedom index, for example, India ranks lower than Haiti, Niger and Sierra Leone. If the state of the Press is so great, why doesn’t the ground reality reflect this sentiment and why then is the Government dead against news channels showing references to Prime Minister Modi when policies of the Government fail? This is especially strange because the face of the Prime Minister is on every scheme and he announces almost all major policies of the Government. It seems that India is stuck with a Prime Minister who ironically loves the limelight but shies away from criticism that comes with it. It is tragic, then, when you look at the state of the country today and its similarities with Orwell’s seminal novel, 1984. In it, Orwell, describes how information management was the primary system of control employed by the authoritarian regime to keep its subjects subjugated. We must not forget that a free, independent Press is an antidote against such authoritarianism. Therefore, though India is celebrating its 72nd independence day, I am sad to say that it’s surely starting to feel a lot like 1984.